The most valuable tool a business can possess is the dedication of the business owner(s). At Competency Coaching, our goal is to harness this passion and provide a framework and structure in areas of business planning, financial analysis, training and professional development. "At Competency Coaching, we strive to be more than a training provider. Having spent the past 10 years listening to business leaders talk about their professional development and training goals, it is clear that inspiration and 'life-long' learning add significant value to their teams performance and motivation. Furthermore, there appears to be great value in a collaborative approach to learning, especially when given the opportunity to network ideas with other business leaders. We believe that strong learning outcomes are driven by organisational goals and a thorough understanding of the competency frameworks that support them. One of our strengths is the ability to paint a picture of successful managers, allowing your team to benchmark their own personal profiles. One of our key offerings are the Mastery Sessions. 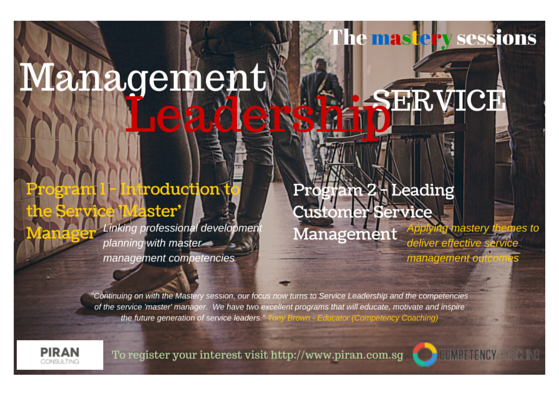 The Mastery Sessions establish learning and development benchmarks for professionals in the service industry. Theoretical perspectives and practical tools are used to 'paint a picture' of the ideal 'master' manager allowing learners to measure their individual level of competence and develop an industry specific professional development plan. As the service industry continues to grow, an incredible number of service managers are dedicating long hours to their trade. Many managers and supervisors have climbed the corporate ladder through hard work and determination. These professionals generally have excellent operational skills and a sound understanding of their management responsibilities. As they move towards senior management though (and maybe business ownership), some of the higher order skills of management mastery can only be progressed through education and professional development paths. Competency Coaching’s charter is to facilitate this advancement by presenting the essential ingredients of the ‘master’ manager and by helping future leaders measure their current capabilities and skill sets against a model set of competencies.